Who stole my letter from Hogwarts? Today I'm gonna share something with you. First of all, mix the flour, baking powder and sugar together. Add the eggs then milk. Leave to rest for at least 15 minutes. When you're ready, heat up your pan and put a little ladle of preparation in it. When you can see some bubbles appear it's time for you to turn over your pancake, and cook the other side. You will make about 15 pancakes, cool, uh? -I prepare everything the day before because when I wake up I'm too tired and impatient, I lack courage ! 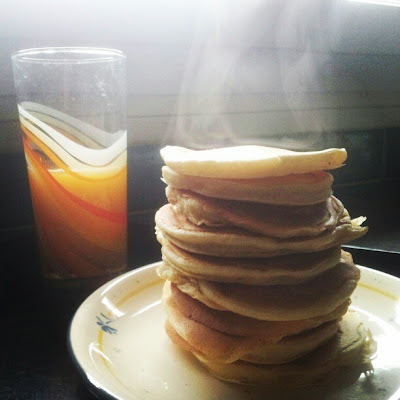 I just have to cook the number of pancakes I want and.. Eat them, of course. -Add you little touch with some vanilla extract, cinnamon, fresh berries, etc in it. Enjoy, and tell me how did you find my recipe ! Oui oui oui ! Tiens moi au courant, j'ai hâte d'avoir ton feedback ! Did you just say cupcakes? Rimmel by Kate Moss n°102.